Looking for a product or educational data sheet? 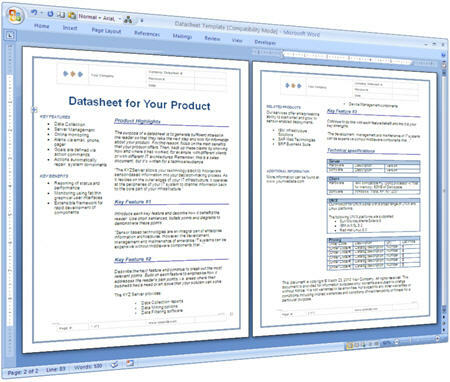 You can use this MS Word Datasheet template to summarize the key features in your product in a professional manner. This will encourage others to learn more about your product, for example, to download the latest product release. 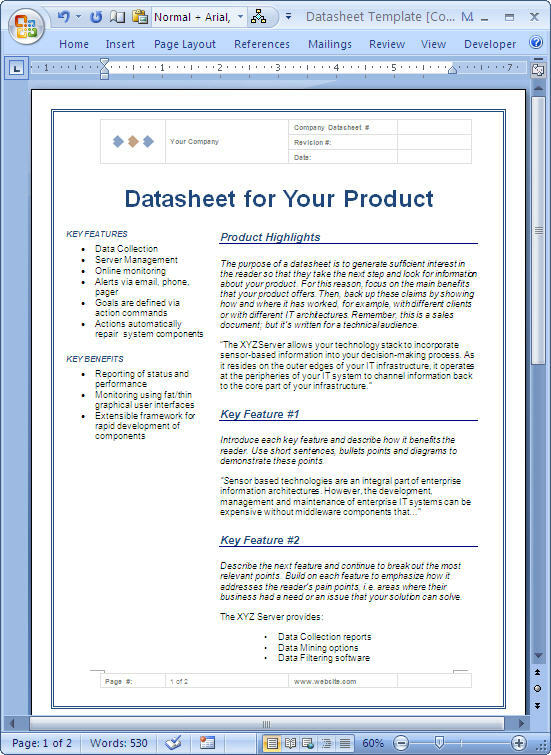 Use this Datasheet template to summarize the key features in your product. The purpose of a datasheet is encourage the reader to learn more about your product, for example, to download the latest release, read your white papers, or compare it against your competitors. Download Now for only $4.99! The datasheet lists key facts, figures, statistics and specifications. It is written for a technical audience who want hard data so that they can make a better decision. The most useful datasheets help the reader come to a decision faster, for example, by highlighting how a new feature resolves a business issue or how new components allow the user to run their business more efficiently. The Target Audience for the datasheet is of a technical nature, for example, IT Managers, CIOs, Product Managers, System Administrators, Technical Writers, Security Officers, Procurement Experts and others who evaluate software, systems and technical solutions. Description – while this document may accompany the sales pack, keep it as concise as possible. Describe what it does, who uses it, where it adds value, and also how to supports the enterprise achieves its over-arching aims. Graphics – provide diagrams, screenshot, and charts to show how the product works. Keep this nice and tidy and don’t take too much screen space. Use the images to accompany the text, not compete against it. Benefits – use bullet points to highlight the key benefits. Features and/or specifications – outline the new features to the user and, for hardware, include specifications. Requirements – list the software and hardware required to support your product. Contact information – Include contact information at the end of the datasheet. Include copyright and trademark information. se, read your white papers, or compare it against your competitors.